By Michael Card, songwriter, teacher, and author of several Bible studies and books, including A Sacred Sorrow and A Violent Grace. Michael also serves as the stylist for the Christian Standard Bible. I was 14 years old when the Bible started to tremble in my hands. Raised in a Baptist church in north Nashville, having “walked the aisle” six years earlier, my experience in and of church was much like anyone else’s. It was 1971—the year that Apollo 15 landed on the moon, James Taylor released “Mud Slide Slim,” and Mount Etna erupted. But all these were insignificant compared to the fact that the Bible began to tremble for me. Up until that time, it was motionless, lying on the desk beside my bed where occasionally I would scan a paragraph or two before falling asleep. Every Sunday, I would carry it, unmoving and inert, under my arm to church. In Sunday school, there was “sword drill.” The leader would command, “Swords up!” as we prepared to race each other to find an obscure verse. My sword, so still and static, was never quite quick enough to win. Though I obediently opened its soft leather cover, the Bible remained a closed book for me. The words on the page remained words on the page. But all that was about to change. I had heard my mother and her friends talk about Mrs. Whittemore. She was elderly and diminutive and blind. She taught the Bible in homes—in hers and several others. I cannot imagine what might have possessed my mother to invite me along, a restless 14-year-old in a room full of older women studying the Bible. What’s more, I have no idea what possessed me to go. But go I did, and in that bungalow-style house in Hillsboro Village, sitting on the floor in a room filled with housewives, listening to a four-and-a-half-foot-tall woman, the Bible first trembled in my hands. They were studying John’s Gospel, though they spent little time there. In the course of one verse, Ms. Whittemore would canvas the whole Bible: “This phrase comes from Exodus,… that word is found in Paul’s writings…this is an image from the Prophets…” She taught from memory and spoke with razor-sharp focus and clarity. I had never heard a woman actually teach the Bible, besides my Sunday school teachers who generally stuck to reading the manual. But Mrs. Whittemore didn’t have a manual. She spoke with quiet confidence and authority. She opened the book, and it would never close again. But she is only half the story. It has taken years for me to realize that as significant as Mrs. Whittemore was, every bit as important was that room full of faithful women. The Bible trembled for me as I noticed it resonating in their hands. They hung on every word of it, took volumes of notes in the margins, talked together about it endlessly outside of class. As the Jesus movement was gathering steam among those who were younger, I was witnessing a parallel outpouring of the Spirit with my mother and her friends. They had grown up in a generation that taught them to accept without question what they heard from the pulpit. But now, in Mrs. Whittemore’s pulpit-less living room, they were being taught to engage with Scripture on their own. And I had been invited to be a witness to their transformation. Together our hearts resonated. Together our nameless community studied and prayed for each other. Together we began to ask better questions. And with all this, the Bible began to tremble in my hands. In time I would be handed off from Mrs. Whittemore to Dr. William Lane. Though the two of them could have not appeared more different—she, soft-spoken and tiny; he, forceful and dynamic—they shared an identical passion for the Word of God, as well as a relentless hunger to understand it and an impossible burden to pass it on to others. Bill also taught substantially from memory. He could traverse the whole corpus from Genesis to Revelation while explaining a single verse. Though the setting was not a cramped Nashville living room but a large university classroom and the audience was not a clutch of mature housewives (plus one restless adolescent) but a class of college students, my experience was virtually identical. As Bill strode between the rows of desks and we scrambled to keep up with his notes and ours, we were caught up in the same movement of the Spirit as the Bible was opened and received hungrily. Once again, it was in the context of community that I discovered the genesis of the movement of the Bible. It trembled in Bill’s hands and all of ours as well. If you’re reading this, one of two possibilities is taking place in your heart and mind. Some of you are resonating with this story precisely because it happened once in your own life. But my guess is more of you are longing to experience this awakening for yourselves, because this kind of radical community engaging with Scripture has simply never occurred in your life. The Bible, though you may dearly love it, remains predominantly closed. These days the temptation is to go out and buy a book or a series of CDs of someone teaching the Bible. (I have produced several of these myself!) But even with the best resources, you invariably end up at home, working through the material alone. 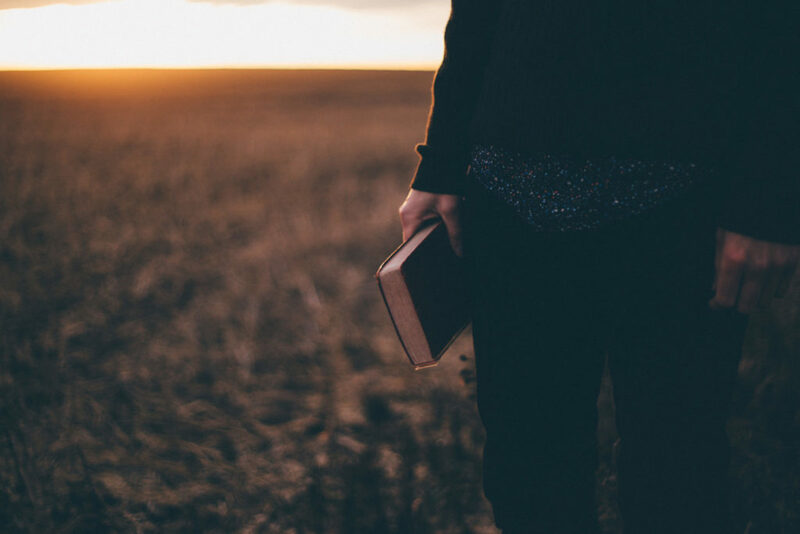 While solitary meditation and study of the Scriptures are vital, the experience of discovering biblical truths in the context of community is irreplaceable. My encouragement to you: first, find that community of men and women who are experiencing your same hunger. If, in the process of looking, you come upon a group that understands itself to have arrived, run swiftly in the opposite direction. Second, pray for a gifted man or woman willing to do the hard homework to prepare to lead such a hungry group. Then, even though it may only be two or three of you who have gathered together in a living room or classroom, together you will experience what happened to me all those years ago and continues to this very day, and the Bible will indeed begin to tremble in your hands. See what Michael Card and other Christian leaders have said about the Christian Standard Bible here, or try out the CSB’s vibrant readability and academic reliability for yourself at read.csbible.com.